Saying that language classes or courses can be “dangerous” may cause a few ripples amongst my peers but I firmly believe that is is the case. By the time you get to the end of this post, you may start thinking the same. Just as you can go to a doctor and sometimes get the wrong advice and suffer as a result, so too the same thing can happen when you go to a language learning course. It is many times too hard for many language learners to judge the true effect of the teaching or material. They might say things like, “the classes are interesting, boring, frustrating” or they might say, “I am learning a lot”. Whatever we say or think, in the final analysis we tend to judge ourselves more than the teacher or materials. One reason for that is the overriding belief, which many of us have been inculcated with, is that “the experts know best”. So we tend to blame ourselves rather than the so called experts when things don’t go as we would like! Ok then, even if that is the case how can that be dangerous? “Surely,” I can hear you thinking, “If I am learning something at least it is better than learning nothing.” Well that might be and maybe for some it is. However what I do want to focus on here is the other possibility, a far more common one. That any learnings we may experience are outweighed by the impact these experiences leave on us. I say more common because the stark reality is that most people give up on learning languages way before the level they hoped to achieve. There is one key factor that causes this. Namely, the progress they experience is too slow and/or too frustrating. Typically language learners will tend to attribute this to their own lack of ability or aptitude. So let us consider why we can say that the dangers of language classes are real. Well to start with, as I have often said in these pages, we all at one stage learned our first language successfully and then we go to school and it all starts to unravel for most of us. The undisputed fact is that we all once had the ability to learn languages. I would contend that this ability has not somehow mysteriously disappeared. What has happened instead is that it has been systematically impacted by many factors, one of the most significant being the experiences we have had in learning languages in formal settings in schools. The typical language classes in many schools rely heavily on a grammar translation method with rote memorisation a key requirement. This method has no relationship at all to how we learned our mother tongue. Furthermore it has been completely discredited time and time again for many decades by virtually every piece of research ever undertaken on language learning. Yet it still persists in many countries and schools. Of course there have been variations and innovations introduced over the years, some of them sounding very promising. However the implementation of many of them have proved to be ad hoc and piecemeal. So it is not surprising that it is VERY difficult to find language learning approaches that consistently yield superior results. As a result, once we start to learn languages in these type of classes, progress is usually slow. (It of course does not need to be). It is one thing to be able to pass tests on vocabulary and grammar. It is quite another thing to become progressively more and more proficient in speaking another language with fluency and confidence. As a result, before too long many start thinking and finally believing – “We are no good at learning languages”. We do not, as I mentioned before, as a rule question the teachers’ ability and blame the lack of progress on them. Even if we do, we are more than likely to apportion the blame partly to ourselves. Once we start questioning our own abilities that soon makes its way into our belief systems. It is then going to be hard to shake that out, unless our experiences later alter that. Unfortunately, what happens in later years is more of the same and each effort only seems to confirm our ineptitude with the resultant belief, which we may or may not be consciously articulate, “I am no good at learning languages”. Many people become so committed to their belief that they will never try again and when they do, it is under duress or circumstances driving them to it. Underneath it all will be same nagging lack of belief in their own abilities, so the results are predictable. There are of course some who can shake off that belief, usually because of experiences they have had when they have traveled or when they landed in a language class that showed them they in fact they have the capacity. Or possibly because of an underlying belief in themselves and their abilities, but this is more often than not an exception. So going to a language class, or undertaking a course, that does not make you believe that you do indeed have the capacities will have you only confirm your beliefs that language learning is hard. That is why language classes are dangerous. So unless you are moving forward in your belief that you can learn the language, you are in fact moving backwards. Why? Because there is no such thing as staying in the same spot. Maybe you have learned a few words or phrases but the real issue is, “Have you become more powerful in your language learning and more sure of yourself? That is the key question! The beliefs that we have formed about our practices are another important aspect to consider. Once we believe there is a certain way of doing something, it can take a lot to move that view. I have consistently seen this in students I have taught for many years. Many will agree with me but then have great difficulty in moving away from what they know and do. It is not surprising as we become comfortable with what we we know and do “easily”. For example it is easy to look up a word in a bilingual dictionary. It is easy to understand that word then. So to move to something else that looks like it requires more “work” might make sense BUT doing it is quite another thing. This kind of practice in remembering words makes most people think that they have a poor memory. You do not, IF you learn in ways that respect the way we all remember things, by linking, contextualising and by personalizing new vocabulary and by embedding in sentences that you can readily produce and understand. Do this and all of a sudden you can start seeing that indeed your memory skills are quite good! 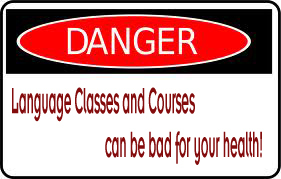 I am not saying that all language classes or courses are “dangerous” but I am saying that many may well be, so as in all things, “caveat emptor” – Buyer beware. Three benchmarks that you can use to judge a course/class is to assess whether you are feeling energised by your learning experiences or depleted by them. Alongside that must be growing skills AND confidence in your new language and your ability to function using it as you learn. If you are feeling all that, then persist. If not, look for alternatives. You now know the reason why!